First of all, this is not my laptop, secondly, I’m not reviewing it. I’m just informing everyone that it has been released by HP last January 8, 2008. It’s an upgrade, or more of a.. ahmmm? a newer version of their tablet PC. It will, I think, replace their previous table PC which is HP Pavilion TX1000, the one that I already owned (btw, I haven’t reviewed it yet, and now a newer model arrives! darn!) Huhuhu… I just bought my laptop last December 2007, and after a month, or weeks perhaps, a newer, more powerful TX series had been released and was featured last January 7 to 10, 2008 at Las Vegas during the International CES (Consumer Electronics Show) 2008. *Sigh* I wished I haven’t bought my laptop yet, kasi ilang days lang may bago na pala agad! amf naman oh!. If you are planning to buy this latest and hottest tablet PC by HP, the price starts from $1,299.00 (2GIG RAM, 250GIG HDD), and is only available in the U.S. 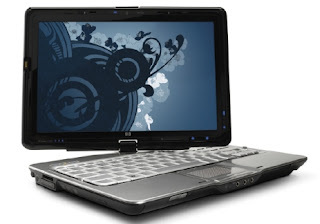 There are a lot of brand new laptops that are available at a very affordable price, specially on eBay. if i… 😛 yun ang sinabi ko if i.. wahahahaha 😀 pero malapit na.. almost 2k na weh.. yiheeeeeeee! oh my.. i want this i want this i want this!!!! Hi where did u get the info where you can upgrade your TX1000 to 250 gig? I talked to an HP support via chat and they told me that you could only upgrade up to 160gig? Please email me with regards to this. I also own TX1000 (TX1213au) and I would like to upgrade my harddrive. I hope you can help me. Thanks. hello, thank u very much for the info!! now, i can say that i am lucky to have this HP Pavilion tx 2000. i just bought it last february 27. i am really convinced that this laptop is far way more than i expected.. This laptop is a pleasure to use. I’ve owned it for a week and it just rocks! Improved WACOM interface than the old model. The finger scanner though is a bit of a tricky thing and it does weight a little heavy for a tablet. Hi how can i create an adsense and earn from it? its nice to know tha you guys are eanring from adsence. kababayan, as i read ur article bout this HP pavillion TX 2000 laptop i was thinking if i could feature this one in our publication.. starstruck talaga ako sa notebook na ito. super nice. i actually had the chance to touch & use this kind of laptop, but that was owned by my uncle…. later this evening,i’l start working for an article featuring this TX2000. thnx for this site of urz…. thnx for the reply… yup taga dvao del sur ako.. silingan lang man ta.hehehhe send my regards to ur mom… friend man pud sila ni mama -bbing almario.. f im not mistaken, kumare din sila. anyways, thnx agin sa info bout HP tX.. la actually ako balak bumili, feature ko lang xa sa publication namin…. tpos ko na ung article bout tx2000, next ung HP touchSMART nman feature ko sa publication nmin… by end of feb. dmi na mkkabasa nung artcle.hehehehe hop they’ll also luv TX2000. ingatz & thnx kc u really find tym 2 rply . batch ba mo nila may fulgerinas sa HCMHS?